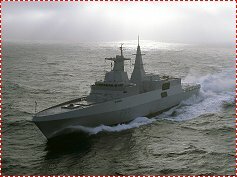 SAS Spioenkop, the third in a series of four Meko A-220AN type stealth corvettes, is due to be officially handed over to the South African Navy at the Blohm+Voss shipyards in Germany today (15 March 2004). This follows successful sea trials conducted last month, which coincidentally included the ship having to operate in Force 9 weather conditions. Performance tests were successfully carried out while Spioenkop was off the coast of Skagen, Denmark. The sea trials were conducted with a full South African crew that had joined the ship at the shipyard. After today’s handover SAS Spioenkop (F147) will take part in further tests including an exercise with ships of the German Navy before heading south for Simon’s Town, where she is expected in late May. SAS Spioenkop, which is named after a hill on which a famous battle took place during the Anglo-Boer War of 1899-1902, will join another two Valour class corvettes already in South Africa, SAS Amatola and SAS Isandlwana. The fourth and last corvette, SAS Mendi is expected later this year.